Uncertainties in the Zodiacal dust model play a leading role in the systematic errors for determining the IRB. The differences in the data from prior IRB observations at 1.2 μm are principally the result of using different models of the Zodiacal dust based on DIRBE observations. The IRTS residual, based on a modified Kelsall DIRBE dust model, closely follows the spectrum of Zodiacal dust and could be entirely explained by a 23 % error in the Zodiacal dust brightness. The narrow-band spectrometer will provide a new and independent measurement of the Zodiacal dust brightness using Fraunhofer absorption lines. Ray trace of the narrow-band spectrometer refracting optics. The narrow-band filter is the first optical element in the assembly. The spectral response of the instrument varies over the FOV, shifting towards shorter wavelengths from center to edge. The entrance aperture is 75 mm. Solar Fraunhofer lines can be used to measure the Zodiacal brightness, which is dominated by scattered sunlight at short wavelengths. Spectroscopy of optical Fraunhofer lines has been used to estimate and remove the zodiacal light for optical extragalactic background measurements, and to study the dynamics of the zodiacal dust cloud. While conceptually simple, Fraunhofer line measurements are prone to their own set of systematic errors most notably absolute calibration, atmospheric extinction, atmospheric scattering of zodiacal light and Galactic starlight, and even atmospheric scattering of reflections off the ground. Airglow emission essentially prevents measurements at λ > 0.55 μm from the ground, which has prevented any useful comparison with the DIRBE dust models. With a small cooled spectrometer on CIBER, we eliminate the systematic errors associated with atmospheric scattering. We will measure the absolute Zodiacal intensity using the Ca II 854.2 nm Fraunhofer line, and then directly compare to the DIRBE Zodiacal dust model at 1.2 μm using the Zodiacal color measured by the low-resolution spectrometer. 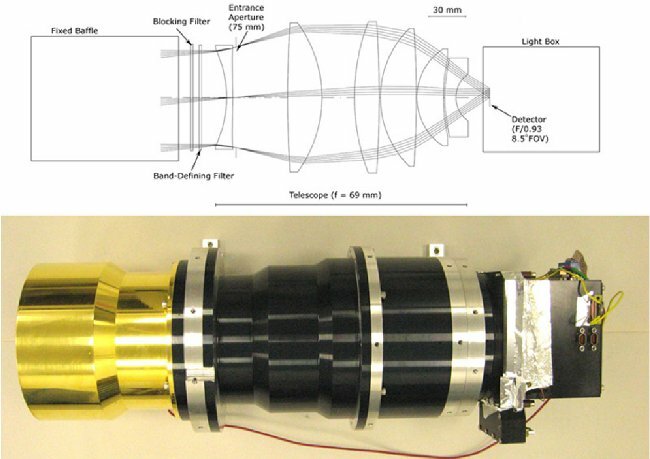 The narrow-band spectrometer (NBS) is a small wide-field refractor with a narrow-band filter placed as the first optical element. Rays passing through such a dielectric etalon experience a wavelength shift λ = λ0 cos Θi, where Θi is the angle of the ray inside the dielectric. Thus the wavelength response of the spectrometer varies over the array, by an amount depending on the entrance angle. This can be tailored so that the response at the array center is tuned on a Fraunhofer line, and then shift entirely off the line at the edge of the FOV. The spectrometer can measure the zodiacal intensity with signal to noise ratio of 50 at the north ecliptic pole in a 50 s observation (with similar S/N at lower ecliptic latitudes in shorter observations). The photon level, signal contrast, and the S/N per pixel, are all low, so careful attention must be paid to dark current, stray light, and out of band blocking.